A little Christmas Eve fun. Crispy outside, soft inside, crazy good. I think they're yummy plain, but butter and maple syrup are good, too. I started from this recipe. Below is my version. John is spending the day in the garage finishing the girls' Christmas gift, so I'm making christmas-y crafts and waffles inside with L. Who knew being a mom at Christmas would be as much fun as being a kid? Blend flour, baking powder, salt, cocoa and sugar together; set aside. Beat egg yolks and milk together; add flour mixture, stirring until just blended. Fold in banana and melted butter; mix well. In a small mixing bowl, beat egg whites until stiff and peaks form; gently fold into batter. Add chocolate chips to taste (I made these a second time, and realized I originally told you to put in way too much chocolate - wishful thinking, I guess!). 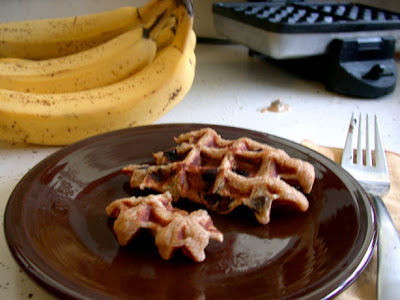 Bake on a waffle iron until the steam stops (or almost stops if you're a little impatient). Chocolate and banana?!? The crazy awesome is a given!!! that sounds awesome! I will definitely be making these - I always seem to have some mushy bananas sitting around... ;) Thanks for sharing! We had these for breakfast this morning and they were gobbled up. Thanks for sharing the recipe!